The Australian 12 foot skiff season has commenced again with the LCC Asia Pacific 12 foot skiff again competing for class honours. Our long running Twitter account www.twitter.com/mergernews has tweeted its 5,000 individual deal update. @MergerNews is a free service that each day updates all material M & A announcements made by listed companies on the Australian Stock Exchange. It can also be followed at www.mergersacquisitionsnews.com . LCC Asia Pacific is a leading Boutique Corporate Finance & Strategic Advisory practice with its Sydney office based on Level 39, Aurora Place, 88 Phillip Street, Sydney. In 2018 LCC Asia Pacific has won multiple international industry awards, for both deals on which it has worked and its excellence as a Firm. The M&A Advisor has recognised LCC Asia Pacific for an outstanding achievement for the divestment of Australian technology engineering products company WearX to Finland’s Metso Corporation. 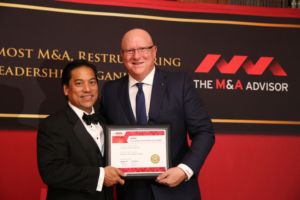 LCC Asia Pacific’s Nicholas Assef was presented the M&A Deal of the Year (US$25 million to US$50 million) award at the ceremony in New York in June 2018. LCC Asia Pacific acted as exclusive strategic & financial advisor to WearX in the transaction. The transaction was conducted on a compressed timetable, with the entire deal completed in around 15 weeks from indicative offers being received to final closing. The highly collaborative approach saw four final round offers submitted – all from international parties.